The Common Gartersnake is highly variable in colour but tends to be black with three stripes: one down the back and one on each side. The stripes are usually yellow. The side stripes are confined to the second and third scale rows. It can grow to over a meter in length. Depending upon the area, the Common Gartersnake can be confused with other species of gartersnake. In British Columbia, there are two other Gartersnakes. The Wandering Gartersnake has a black stripe, but has dark spots. The Northwestern Gartersnake can be quite similar, but is generally brown, rather than black. From Alberta to Manitoba, the other confusing species is the Plains Gartersnake, but it has squarish black spots as well as the stripes. 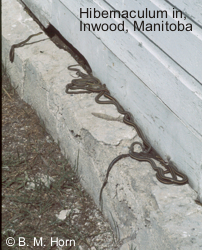 In southern Ontario, Butler's Gartersnake looks very similar, but the side stripes are on the second, third and fourth scale rows. There is also the Ribbonsnake, which is quite similar to the Common Gartersnake. Its side stripes are only on the third and fourth scale rows. 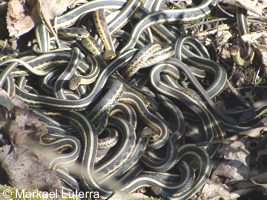 Maritime Gartersnake (T. s. pallidulus) which occurs throughout southern Québec and the maritime provinces. Several subspecies of T. sirtalis occur across almost all of the US, with the exception of the driest areas in the southwest. The Common Gartersnake is found in a wide variety of habitats from forests to farmlands. It also occurs in many urban areas. It is usually found near wetlands of some sort. reeding generally occurs in the spring, soon after emerging from hibernation, but it can also occur in the fall. In some areas, it is possible to see many snakes involved in mating frenzies near hibernation sites. Females typically give birth to 10-30 live young in mid-summer. Up to 85 young have been reported from one female! The young are 13-23 cm at birth and mature in 2-3 years. The Common Gartersnake is the most commonly encountered snake in most parts of its range. It has adapted well to human modification of the landscape. It is active during the day and is commonly seen in moist areas where it hunts frogs, toads, salamanders and earthworms. Small fish and mice are also eaten. The Common Gartersnake hibernates underground in burrows, rock outcroppings, or the foundations of old buildings. In some areas, hundreds or even thousands of snakes will hibernate in the same location. 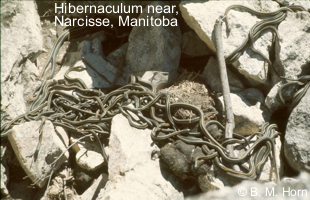 The Common Gartersnake is widespread and abundant in Canada. Aside from loss of wetlands, the greatest threat to this snake is likely traffic mortality. Many snakes are drawn to warm roads in the evening and are killed by passing cars.